A two-time NASCAR series champion saluted his racing hero as well as his own team in accepting his series awards during ceremonies Saturday night. Speedway in two weeks. The Showdown features drivers from all four NASCAR AutoZone Elite Division Late Model series for a rich, post-season event. Diercks also gave a large helping of credit for his 2005 championship to crew chief Nick Carlson. “Nick is like a brother to me. As a crew chief, we wouldn’t be here as champions without him,” Diercks said. He also credited his car owner-father with fielding a championship team, as well as his entire team. “The crew gives us support, hard work and determination,” Diercks said. Justin Diercks, 25, of Davenport, Iowa, was honored for his second consecutive NASCAR AutoZone Elite Division, Midwest Series championship. In accepting his awards and championship hardware that included the traditional champion’s ring, Diercks saluted 49-year-old series veteran Steve Carlson, who finished second in the 2005 points race. 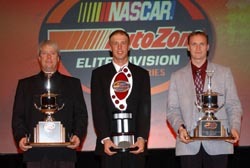 Diercks edged Carlson for the 2005 NASCAR AutoZone Elite Division by 56 points. Tim Schendel finished third in points followed by 2006 Sunoco Rookie of the Year award winner Andrew Morrissey. Morrissey was racing in Illinois Saturday night, but made it to the banquet just before its conclusion to receive his award. Master of Ceremonies Craig Armstrong asked Diercks, himself the series Rookie of the Year in 1998, to present the award. Completing the top-10 in the series 2005 points race were Dexter Bean, Brent Kirchner, Russ Blakeley, Nick Joanides and Greg Fowler. Special award recipients during the ceremonies, held at the Radisson Hotel and Conference Center in Green Bay, Wisc., include: Featherlite Most Improved Driver Award, Josh Bauer; Powerade Power Move of the Race Award, Justin Diercks; Budweiser Pole Award, Erik Darnell; Sportsmanship Award, Tim Schendel; Driver Achievement Award, Brent Kirchner; Most Popular Driver Award, Steve Carlson; Lunati Champion Crew Chief Award, Nick Carlson; Champion Car Owner Award, Steve Diercks; Hoosier Tire Champions Award, Justin Diercks. 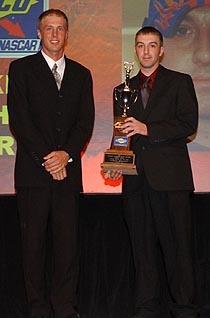 Diercks (left) presented the Rookie of the Year trophy to Andrew Morrissey (right).